Progesterone is made primarily by the ovaries. The adrenal glands, peripheral nerves, and brain cells produce lesser amounts. Geburtshilfe Frauenheilkd. 2014 Nov; 74(11): 995–1002. Received 2014 Jan 27; Revised 2014 Oct 1; Accepted 2014 Oct 1. Around 14.5 million peri- and postmenopausal women currently live in Germany. Moreover, approximately 450 000 women, each with a life expectancy of around 85 years, reach menopause every year in Germany. The challenge is therefore to find a therapy with few side effects which could improve the quality of life of women with menopausal symptoms. The aim of hormone therapy (HT) is to remedy hormone deficiencies using substances that offer the best trade-off between benefits and risks. This is where progesterone has a new and important role to play. Progesterone is one of the most important gestagens. Biologically effective progesterone formulations created with micronization techniques have been used in clinical practice since 1996. Nevertheless, up until 2003 preference was given to synthetic gestagens rather than progesterone. The increased breast cancer hazard ratio of 1.23 reported in the WHI study and of 2 given in the Million Women Study has been associated with the use of synthetic gestagens. 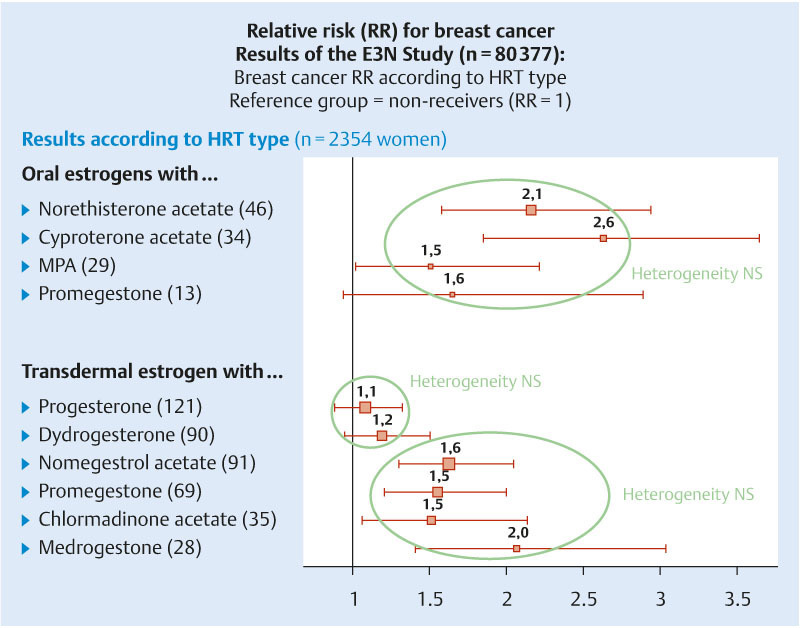 In a comparison between synthetic gestagens and progesterone, the E3N Study showed that the transdermal administration of estrogen and progesterone did not lead to an increase in breast cancer rates (RR: 1.08). The administration of progesterone does not change the HDL/LDL cholesterol ratio. Because of its anti-mineralocorticoid effect, progesterone has no impact on carbohydrate metabolism, hemostasis, blood pressure, thrombogenicity and body weight. The administration of 200 mg/day progesterone over 12 days of a menstrual cycle or a daily administration of 100 mg combined with an estrogen are a safe and well-tolerated option to treat menopausal symptoms, with a better benefit risk profile compared to synthetic gestagens. Investigations into the physiological effects of progesterone started at the beginning of the 20th century 1. The destruction of the ovarian corpus luteum was found to result in abortion in pregnant animals. This could be prevented if animals were given an injection of corpus luteum extract. A number of research groups, working independently, finally managed to isolate progesterone from corpus luteum extract in 1934. The substance was first known as progestin in the USA and as luteosterone in Europe. In 1935 scientists agreed to name it progesterone as an indication that this hormone plays in important role in pregnancy (pro gestationem [Latin]: i.e., favoring gestation) 2, 3. In the mid-1940s, Russell Marker managed to synthesize large amounts of pure progesterone from diosgenin, which could be sourced from plants. However, very high oral doses were necessary to obtain biological effects. Advances in galenical formulation, particularly in micronization techniques, improved the resorption property of progesterone, and after 1980 oral therapy using natural progesterone was possible 4, 5. Progesterone is a steroid with 21 carbon atoms. In the human body it is produced in syncytiotrophoblasts and luteinized granulosa cells of the ovarian follicles, in the cortical fascicles and the retinal areas of the adrenal cortex. Precursors of progesterone include LDL, VLDL, HDL and cholesterol synthesized de novo (VDL: very low density lipoprotein). Around 95–98 % of progesterone in blood is protein-bound, with most of it bound to serum albumin. Oral administration increases plasma levels of progesterone metabolites, primarily of pregnandiol, pregnanolone (dihydroprogesterone), pregnandione, 20-α-dihydroprogesterone and 17-OH-progesterone 6, 7, 8. 5-α-hydroxysteroid dehydrogenase converts metabolic intermediates to allopregnanolone, an important neuroactive steroid 9, 10. Progesterone has both systemic and local effects. At the systemic level, progesterone increases diuresis through activation of the renin-angiotensin system, triggers the catabolic metabolism, relaxes smooth muscle cells, increases excretion of calcium and phosphorus, raises basal body temperature, has sedative and analgesic effects, improves visual memory and the proliferation and differentiation of osteoblasts and has additionally been found to have an immunosuppressive effect 11. For a long time, however, the established opinion was that oral administration of progesterone had only limited efficacy, as its bioavailability was strongly reduced due to the hepatic first-pass effect 12. This led to the use of synthetic gestagens such as derivatives of testosterone or 17-hydroxyprogesterone, as they are more resistant to hepatic degradation. But synthetic gestagens are associated with significant side effects due to their anti- or pro-estrogen effects, anti- or pro-androgen effects, mineralocorticoid effects and negative effects on glucose metabolism and lipid metabolism 13. Advances in micronization and the suspension of progesterone in oil solutions has led to new data, which has demonstrated the bioavailability of orally administered progesterone 13. Simon et al. additionally showed that the highest serum levels were obtained when oral progesterone preparations were taken together with food 14.
stimulating the development of lobuli and mammary ducts in breast tissue 23, 24. High levels of progesterone during pregnancy serve to prepare the mammary glands for lactation 25. These effects indicate a number of areas where progesterone administration could be beneficial. Several studies have recently shown that micronized progesterone is tolerated better than synthetic gestagens 35, 36, 37. Progesterone plays a very important role for the endometrium, primarily in the implantation and development of the fertilized ovum. It is significantly involved in the proliferative to secretory transition of the endometrium, the decidualization of the endometrium, in triggering the synthesis of PAPP-A (pregnancy-associated plasma protein A), PP14 (placental protein 14) and uteroglobin, the development of PIBF (progesterone-induced blocking factor), the switch from Th1 to Th2 cells (Th cells: T helper cells), the stimulation of prostaglandin E2 production and suppression of the matrix metalloproteinases MMP3 and MMP9 38. All these factors are essential parts of normal development during pregnancy. In the breast, progesterone causes down-regulation of estrogen receptors and inhibits estrogen-induced proliferation of epithelial cells 39. After initial stimulation progesterone can arrest human cancer cell growth in the late G1 phase (G: gap) of the 2nd cycle 40. In a study using breast tissue obtained by fine-needle aspiration biopsy it was found that normal increases in progesterone during the luteal phase results in down-regulation of estrogen receptors but not of progesterone receptors. This points to an important anti-estrogen and anti-proliferative effect in breast epithelial cells 41. Other studies have confirmed that cell proliferation depends directly on the estrogen-progesterone ratio in breast tissue and is lower in the luteal phase than in the follicular phase 42. This means that progesterone exerts an overall protective effect on breast tissue. Additional factors which reinforce this protective effect include an apoptosis-inducing effect together with the inhibition of 17β-HSD (hydroxysteroid dehydrogenase) reductive activity in breast tissue, which is particularly active in breast cancers 43, 44. Various effects of progesterone administration in peri- and postmenopause are summarized below. Although the oral bioavailability of progesterone is not high, the PEPI trial convincingly demonstrated that progesterone offers endometrial protection in women receiving estrogens to treat menopausal symptoms. This placebo-controlled trial investigated the efficacy of micronized progesterone for the prevention of endometrial hyperplasia and compared a placebo group with 2 different MPA administration regimens (MPA: medroxyprogesterone acetate). Micronized progesterone, administered once daily for 12 days prior to going to bed was found to protect the endometrium from hyperplastic changes associated with estrogen-only therapy as effectively as the two MPA therapies 34 (Table 1). Similar data on endometrial protection were presented previously by Lalumiere and colleagues 45. They also showed that women who received micronized progesterone had significantly fewer bleeding episodes and shorter bleeding than the control group who received MPA. In this study the patients also received 200 mg progesterone for 12 days in every cycle. In a 2001 study of 336 women with early menopause, Pélissier et al. 46 also found that micronized progesterone provided effective endometrial protection. In their study, one group received transdermal estrogen plus chlormadinone acetate 10 mg/day and the other group received transdermal estrogen plus 200 mg progesterone for 14 days. 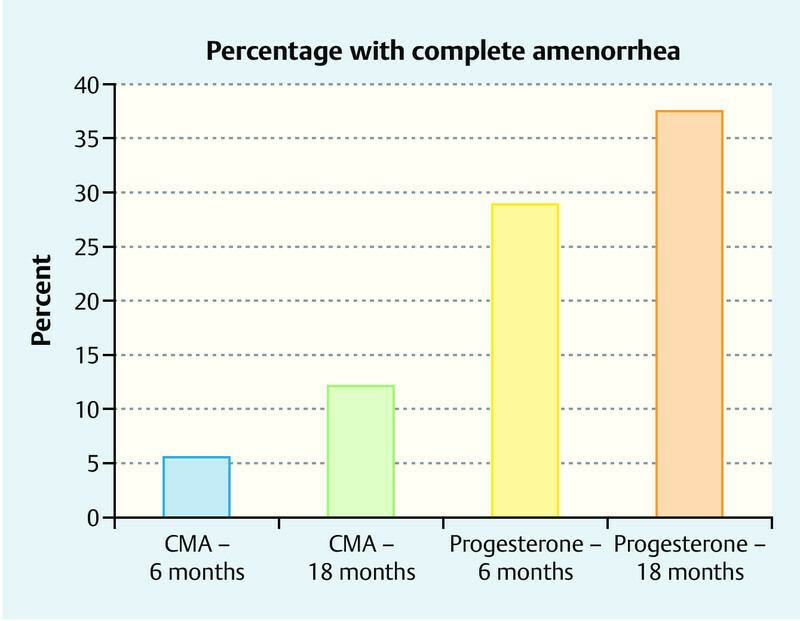 Around one third of the women who received micronized progesterone had amenorrhea after 6 and 18 months. Overall bleeding status was more stable with progesterone than with chlormadinone acetate (Fig. 1). As the transformation dose for progesterone is 2000 mg per cycle, patients should receive either 100 mg/day continuously or 200 mg/day sequentially for a period of 12–14 days every cycle to ensure satisfactory secretory transformation of the endometrium in women previously treated with estrogens 47. Since the publication of the WHI study 48 HT in menopause has been associated with increased rates of breast cancer. Both the data of the WHI study and the results of the Million Women Study 49 led at the beginning of 2000 to an abrupt drop in hormone treatments for menopausal symptoms. The association was also reported for animal experiments 50: long-term administration of estradiol and progesterone had a promotional effect on breast cancer after treatment with carcinogenic substances or spontaneously. Investigations of breast cancer cell lines showed that high concentrations of progesterone had an antiproliferative (pro-apoptotic) effect, but that the reverse effect was obtained with low MPA concentrations. Synthetic gestagens such as MPA or norethisterone alone or in combination with estrogens can stimulate breast cancer cells in vitro. However, progesterone alone or in combination with estrogens had an antiproliferative or neutral effect 51, 52, 53. In a quantitative mouse model, Otto et al. 54 showed that the same dose of MPA had a proliferative effect on breast tissue and an inhibitory effect on the uterus, while no such association was found for progesterone. A twofold higher dose of progesterone was required to induce proliferative effects in breast tissue compared to the doses which resulted in complete inhibition of estradiol-activated endometrial proliferation. It appears therefore that progesterone administration is associated with a beneficial safety margin between the desirable inhibition of endometrial proliferation and undesirable epithelial cell proliferation in the mammary gland. No such safety margin was found for MPA. Murkes et al. 55 reported that treating postmenopausal women with 1.5 mg/day estradiol in the form of a gel and 200 mg progesterone administered orally for 14/28 days did not significantly increase epithelial cell proliferation in the breast compared to baseline values, while the administration of 0.625 mg/day CEE (conjugated equine estrogen) plus 5 mg MPA on 14 out of 28 days significantly increased proliferation. At the same time, the number of bcl-2-positive (bcl-2: B-cell lymphoma 2) breast cells was reduced, indicating an apoptotic effect at the end of the gestagen phase. In recent years, the importance of mammographic density as a risk factor for the development of breast cancer has become increasingly clear 56. In a case-control study, Heusinger et al. 57 showed that patients with breast cancer had a significantly higher mammographic density compared to women without disease. However, both the female breast and mammographic density is affected by many hormonal influences. Boyd et al. 58 showed that mammographic density increases with HT, while antiestrogen tamoxifen treatment decreases mammographic density. The impact of HT has also been confirmed by other study groups 59, 60, 61. As shown in Table 2, progesterone is associated with a number of partial side effects which clearly differentiate it from all synthetic gestagens. This profile outlines the individual effects on different parameters in the human body. Several studies (PEPI, WHI and HERS trials [PEPI: Postmenopausal Estrogen/Progestin Interventions; HERS: Heart and Estrogen/Progestin Replacement Study]) 34, 48, 62 have shown that non-diabetic postmenopausal women have significantly lower fasting blood glucose levels and even lower fasting insulin levels during oral estrogen or estrogen-gestagen treatment compared to placebo groups. The administration of progesterone is not expected to cause any relevant changes to glucose metabolism. The E3N Study 63 also showed that administration of transdermal estrogen with micronized progesterone significantly reduced the risk for diabetes, even over a significant period of exposure. In contrast to synthetic gestagens progesterone has no detrimental effect on glucose balance. All existing studies on progesterone show that, in general, the effect of progesterone on blood pressure is neutral and it may even have a slightly antihypertensive effect. The PEPI trial found no increase in blood pressure in either the estrogen group or the estrogen/progesterone group compared to placebo-treated controls 64. Both the PEPI trial 64 and the WHI Study showed 34, 48 that postmenopausal HT-treated women had a lower body weight gain on average compared to women receiving no hormone therapy. The progesterone administered during the PEPI trial was also neutral with regard to body weight, suggesting that progesterone has no effect on this parameter. Overall, estrogen therapy is associated with positive long-term effects (HDL-C levels [C: cholesterol] increase, LDL-C levels decrease) on the lipoprotein profile of postmenopausal women, although it should be noted that this effect was found more commonly for orally administered estrogen. In contrast to these findings, synthetic gestagens if combined with estrogens reduce HDL-C concentrations. A direct comparison with synthetic gestagens (MPA, norethisterone or norgestrel) showed that micronized progesterone has fewer negative effects on HDL-C metabolites compared to synthetic gestagens. Saarikoski et al. 65 carried out a study in 80 perimenopausal women treated for functional menometrorrhagia. The women were divided into 2 groups to receive either 300 mg/day oral micronized progesterone for 10 days per cycle or 15 mg/day norethisterone for 10 days per cycle over 6 consecutive cycles. The study showed that HDL-C levels remained stable with progesterone, but there was marked decrease in HDL-C levels in the norethisterone group (p < 0.001). The previously mentioned PEPI trial also showed that, in significant contrast to medroxyprogesterone used in the other arms of the study, progesterone has the least impact on the positive effect on HDL-C caused by estrogens 64 (Fig. 2). Progesterone exerts several effects on the central nervous system. Chief among these are a sedative effect, created by its metabolites, in particular 5α- and 5β-allopregnanolone. Doses of up to 1200 mg have been trialed in various studies. It was found that patients subjectively described a feeling of fatigue but experienced no impairment of psychological or physical performance 66, 67, 68. This phenomenon can be put to good use to treat postmenopausal women suffering from sleep disorders by administering progesterone in the evening. Here again an important difference was noted between progesterone and the synthetic gestagens: synthetic gestagens are not converted into the above-mentioned metabolites and thus have no soporific effect. Schumacher et al. 69 reported that progesterone has neuroactive properties and can exert anxiolytic and antiepileptic effects in selected patients 70, 71. The previously mentioned PEPI trial 34 was the first big study to use oral micronized progesterone to treat postmenopausal symptoms. In this 3-year, placebo-controlled prospective study, 875 non-hysterectomized postmenopausal women were randomized and divided into the following study arms: placebo for 28 days, 0.625 mg CEE/day for 28 days, 0.625 mg CEE plus 2.5 mg medroxyprogesterone acetate either continuously or cyclically for the first 12 days, and 0.625 mg CEE plus 200 mg progesterone for the first 12 days. Endometrial biopsies were performed in 596 patients after the therapy to demonstrate the endometrial safety of HT. As expected, the rate of endometrial changes was highest in the group which had received CEE alone, while no significant endometrial pathologies were found in patients in the 3 study arms treated according to gestagen protocols (Table 1). The study investigated many additional parameters including subjective well-being, metabolic parameters, blood pressure, changes in body weight, etc. No negative effects were found in the group of women receiving progesterone. A much bigger study, the French E3N cohort study 63, collected data from more than 87 000 postmenopausal women to assess the efficacy and safety with a particular focus on breast cancer and thromboembolism rates. A number of different gestagens were compared with micronized progesterone. Breast cancer rates and thromboembolism rates did not increase after the administration of progesterone in HT in contrast to women who did not receive hormone treatment (odds ratio was 1.08 for breast cancer [Fig. 3] and 0.9 for thrombosis [Fig. 4]). The most recent publication of the KEEPS Reports (KEEPS: Kronos Early Estrogen Prevention Study) in 2011 not only reported positive effects of progesterone on cognitive functions but also described a protective effect for the cardiovascular system; at the same time, the risk of breast cancer was not increased in women receiving either placebo or 0.45 mg CEE plus 200 mg progesterone for 12 days or 50 µg estradiol per day administered via a patch together with 200 mg progesterone for 12 days. Rates for endometrial cancer, stroke, myocardial infarction and thromboembolism were also the same in all 3 groups 72. The only absolute contraindications for progesterone administration in the narrower sense are rare autoimmune allergic reactions and anti-epileptic drugs or tuberculostatic agents as the intake of these drugs is associated with rapid hepatic degradation. Progesterone or corpus luteum hormone can be used safely and effectively to treat menopausal symptoms or for hormone substitution in menopausal women, as it constitutes a bio-identical preparation which can be used to correct deficiency symptoms. Administration to achieve the necessary transformation dose for endometrial safety through progesterone can be either continuous (100 mg/day) or cyclical (200 mg/day) for 12–14 days. Conflict of Interest The author is medical director of the company Velvian GmbH, a member of the Exeltis Group. 1. Williams C L, Stancel G M. Elmsford, Oxford: Pergamon Press; 1996. Estrogens and Progestins; pp. 1411–1440. 2. Millart P, Paszkowski T. Progestageny w praktyee ginekologieznej. Ginekol Prakt. 2002;67:16–21. 3. Paszkowski T, Kozlowska J. Progesteron-druga mlodosc starego leku. Ginekol Prakt. 2003;70:52–57. 4. Loose D S, Stancel G M. New York: McGraw-Hill; 2006. Estrogens and Progestins; pp. 1541–1571. 5. Morville R, Dray F, Reynier J. et al. Biodisponibilité de la progestérone naturelle administrée par voie orale. Mesure des concentrations du stéroide dans le plasma, lʼendomêtre et le tissue mammaire. J Gynecol Obstet Biol Reprod. 1982;11:355–363. 7. Ottosson U B, Carlstrom K, Damber J E. et al. Serum levels of progesterone and some of its metabolites including deoxycorticosterone after oral and parenteral administration. Br J Obstet Gynecol. 1984;91:1111–1119. 11. Paszkowski T. Renaissance of the clinical applications of a progesterone. Gin Politec Project. 2011;19:41–47. 21. Gálik M, Gáspár R, Kolarovszki-Sipiczki Z. et al. Gestagen treatment enhances the tocolytic effect of salmeterol in hormone-induced preterm labor in the rat in vivo. Am J Obstet Gynecol. 2008;198:3190–3.19E7. 35. Fitzpatrick L A, Pace C, Wiita B. Comparison of regimens containing oral micronized progesterone or medroxyprogesterone acetate on quality of life in postmenopausal woman: a cross-sectional study. J Womenʼs Health Gender-based Med. 2000;9:381–387. 37. Cummings J A, Brizendine L. Comparison of physical and emotional side effects of progesterone or medroxyprogesterone in early postmenopausal women. Menopause. 2002;9:254–263. 38. Schindler A E. Einsatz von Gestagenen in der Schwangerschaft. Therapeutische und präventive Anwendungsmöglichkeiten. Frauenarzt. 2005;46:586–589. 39. Malet C, Spritzer P, Guillaumin D. et al. Progesterone effect on cell growth, ultrastructural aspect and estradiol receptors of normal human breast epithelial (HABE) cells in culture. J Steroid Biochem Mol Biol. 2000;73:1319–1330. 45. Lorrain J, Lalumiere L G, Caron P. The effects of oral micronized progesterone on bleeding patterns, endometrial histology and bone density in postmenopausal woman on hormone replacement therapy. Int J Gynaecol Obstet. 1994;46:77–79. 47. Göretzlehner G, Lauritzen C, Römer T, Rossmanith W. Berlin: De Gruyter; 2011. Praktische Hormontherapie in der Gynäkologie. 6. Aufl. p. 44. 52. Franke H R, Vermes I. Differential effects of progestogens on breast cancer cell lines. Maturitas. 2003;46 01:555–558. 71. Herzog A G. Reproductive endocrine considerations and hormonal therapy for women with epilepsy. Epilepsia. 1991;32:527–533. Table 1 Results of the endometrial biopsies at the end of the trial 34. Amenorrhea after 6 and 18 months receiving either 10 mg chlormadinone acetate or 200 mg progesterone administered cyclically for 14 days 46. CMA: chlormadinone acetate. Table 2 Progesterone and synthetic gestagens and their properties (mod. nach 73. 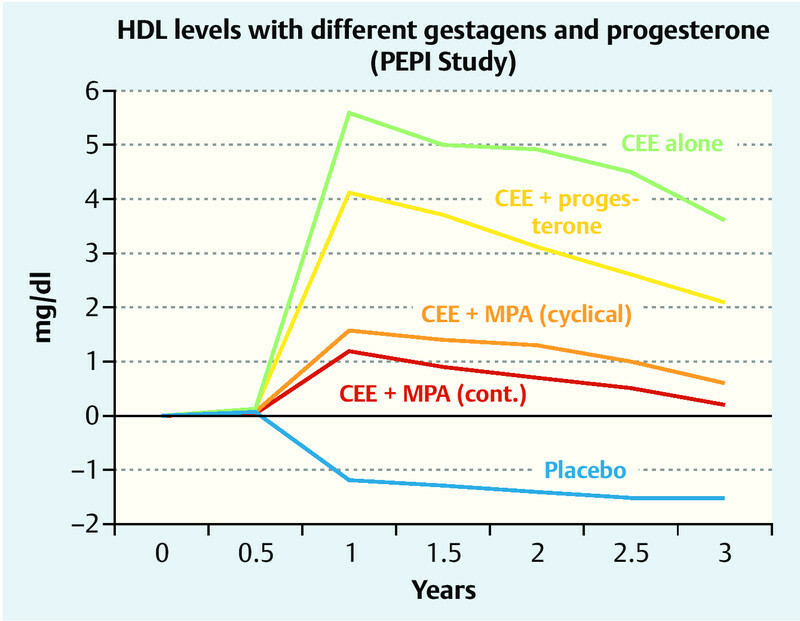 Changes in HDL-C levels (HDL-C: lipoproteins with high density cholesterol) after estrogen monotherapy, estrogen and progesterone administration, cyclical administration of estrogen with MPA (medroxyprogesterone acetate), continuous administration of estrogen with MPA, and placebo (from the PEPI trial) 64. CEE: conjugated equine estrogen. Breast cancer rates: results of the E3N Study 63. MPA: Medroxyprogesterone acetate. Thromboembolism rates for different gestagens and progesterone in the E3N Study 63. Progesterone ensures the development and function of the breasts and female reproductive tract. In the brain, progesterone binds to certain receptors to exert a calming, sedating effect. It improves sleep and protects against seizures. Progesterone is also a diuretic. It enhances the sensitivity of the body to insulin and the function of the thyroid hormones. It builds bone and benefits the cardiovascular system by blocking plaque formation in the blood vessels and lowering the levels of triglycerides. Progesterone also can increase libido and contribute to the efficient use of fat as a source of energy. Progesterone also has a role in skin elasticity and bone strength, in respiration, in nerve tissue and in female sexuality, and the presence of progesterone receptors in certain muscle and fat tissue may hint at a role in sexually-dimorphic proportions of those. Progesterone receptor antagonists, or selective progesterone receptor modulators (SPRM)s, such as RU-486 (Mifepristone), can be used to prevent conception or induce medical abortions (Note that methods of hormonal contraception do not contain progesterone but a progestin). Progesterone may affect male behavior. Progesterone is starting to be used in the treatment of the skin condition hidradenitis suppurativa. Since most progesterone in males is created during testicular production of testosterone, and most in females by the ovaries, the shutting down (whether by natural or chemical means), or removal, of those inevitably causes a considerable reduction in progesterone levels. Previous concentration upon the role of progestagens (progesterone and molecules with similar effects) in female reproduction, when progesterone was simply considered a “female hormone”, obscured the significance of progesterone elsewhere in both sexes. The tendency for progesterone to have a regulatory effect, the presence of progesterone receptors in many types of body tissue, and the pattern of deterioration (or tumor formation) in many of those increasing in later years when progesterone levels have dropped, is prompting widespread research into the potential value of maintaining progesterone levels in both males and females. Previous studies have shown that progesterone supports the normal development of neurons in the brain, and that the hormone has a protective effect on damaged brain tissue. It has been observed in animal models that females have reduced susceptibility to traumatic brain injury and this protective effect has been hypothesized to be caused by increased circulating levels of estrogen and progesterone in females. A number of additional animal studies have confirmed that progesterone has neuroprotective effects when administered shortly after traumatic brain injury. Encouraging results have also been reported in human clinical trials. The mechanism of progesterone protective effects may be the reduction of inflammation that follows brain trauma.